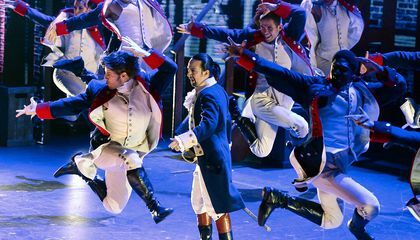 Historic sites connected to Alexander Hamilton are getting a lot more visitors than they used to, thanks to a little Broadway show you might have heard about. 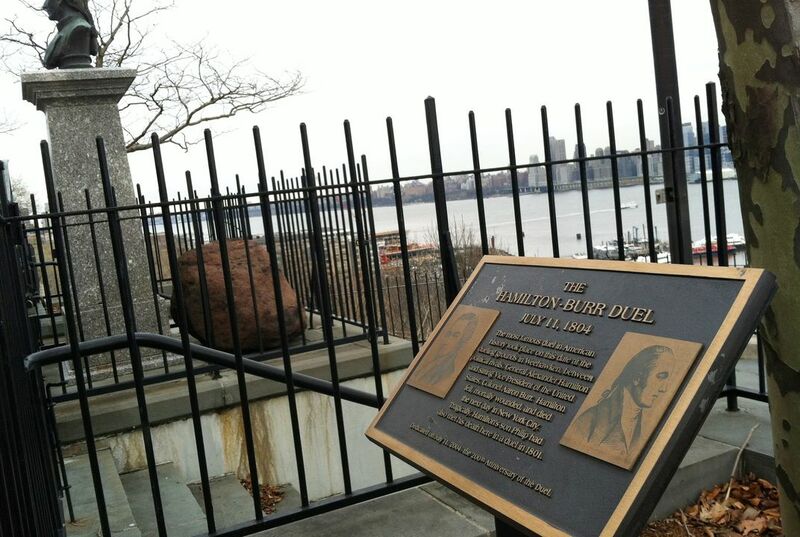 Fans of the musical "Hamilton," which won 11 Tony Awards, are hunting down every Hamilton spot they can think of, from his home in Harlem, to his burial site in Lower Manhattan, to Hamilton Park in Weehawken, New Jersey, near the dueling grounds where he was shot by Aaron Burr. Kerissa Bearce, 35, an instructional technology coach from Fort Worth, Texas, visited all those sites and many more when she came to New York to see the show with two friends. "I pretty much don't remember anything about the founding of my country, but now I'm learning all of it," Bearce said. Bearce is among thousands of "Hamilton" fans boosting visitor numbers at historic sites that in the past were barely on tourists' radars. Hamilton Grange, his Harlem home and a National Park site, had as many visitors in the first five months of this year as it did in all of 2015, more than 35,000 people. And that's a 75 percent increase over the 21,000 visitors who toured the Grange in 2014, the year before "Hamilton" opened. Artifacts at the site include a piano that Hamilton's daughter Angelica played. A replica of the instrument is featured in the show. But fans are also finding their way to more obscure spots, like the Schuyler-Hamilton House in Morristown, New Jersey, where Hamilton courted his wife Eliza. "We have 5-year-olds, 16-year-olds, 30-year-olds coming here now," said Pat Sanftner, who gives tours of the Schuyler-Hamilton House. "We did not have that audience in our museum before. We had 60-year-olds. It's wonderful to have these conversations now with visitors. We're not just teaching. They're questioning us and they're thinking." Tourists have always visited Hamilton's tomb in the graveyard at Trinity Church in Lower Manhattan. But now, not only are more people paying their respects, but they're also looking for the graves of Hamilton's wife, sister-in-law, son and his buddy Hercules Mulligan. "Visitors also now leave flowers, stones, coins, notes, even a potted plant, at Hamilton's monument and on Eliza's stone just in front of it," said Trinity spokeswoman Lynn Goswick. The show's star and creator, Lin-Manuel Miranda, wrote part of "Hamilton" at the Morris-Jumel Mansion in Manhattan's Washington Heights. The mansion's executive director, Carol Ward, estimates that half of their visitors now come because of the show. "We've been riding the wave," Ward said. "The show has gotten people interested in history in a completely new, fresh way." The Morris-Jumel Mansion is known for a dinner party hosted there by President George Washington for his cabinet, attended by Hamilton, John Adams and Thomas Jefferson. (A different dinner party depicted in the show's song "The Room Where It Happens" took place at Jefferson's residence, now marked with a plaque at 57 Maiden Lane in Lower Manhattan.) But the mansion has a Burr connection, too. Burr married the rich widow who owned the house. She later divorced Burr, and her lawyer was Hamilton's son. A truly obscure spot on the Hamilton trail is a well where a woman's body was found in 1800. It is in Manhattan's SoHo neighborhood. Hamilton and Burr defended the woman's lover against a murder charge, and while the well isn't mentioned in the musical, the trial is referenced in one song. That was enough to send Bearce and her friends looking for the well. It is now located inside the COS clothing store on Spring Street. "We were in pursuit of that well," said Bearce. Some destinations are advertising in the Broadway Playbill for "Hamilton," including the Caribbean island of Nevis, where Hamilton was born, and the Museum of American Finance on Wall Street, where Hamilton founded the Bank of New York. The museum has an Alexander Hamilton Room. Why are so many Hamilton sites in New York? There are many Hamilton sites in New York because he spend a bit of his life there. The sites are in a convenient location for Hamilton fans, as it allows them to watch the musical and visit important monuments related to Hamilton all within close proximity. I think this was a very well written article. I love the musical Hamilton and it helped me learn all about his history. It also made me like history better as a whole and over the summer I visited Nevis and while I walked down the streets it was cool to think about how he could have walked around here and been here. I defiantly want to visit more places where he has been. There are so many Hamilton sites in New York because it was the first place Hamilton went when he immigrated to America. Hamilton thrived in New York and spent most of his life there. The music in "Hamilton" destroys the barrier between Americans and our Founding Fathers. This makes us care deeply about the characters in the show by seeing what they go through and hearing it from their point of view.